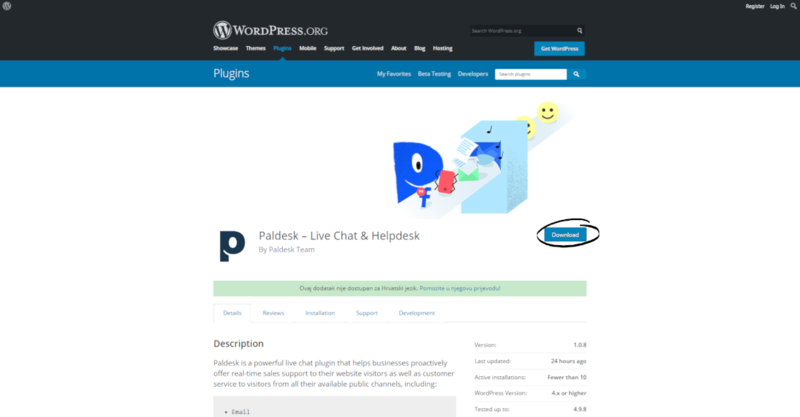 Be available to your customers by using Paldesk Live Chat widget to provide better customer service with a native WordPress integration. Our live chat & helpdesk plugin for WordPress allows you to talk to your customers in real time. Find out how in our installation guide. How to install Paldesk on a WordPress website? There are two ways to do it. You can do it automatically or manually via a plugin website. For an automatic installation through WordPress, you should follow these steps. Step 1: In the administration section of your WordPress site, click on the ‘Plugins’ tab in the left panel, then click ‘Add New’. Search for ‘Paldesk – Live Chat & Helpdesk’. Step 2: You should see the plugin in the list. All you should do is click ‘Install now’ button. When installation finishes, click ‘Activate’. Step 3: After activation, ‘Paldesk’ will show up in the left-hand menu in your WordPress admin section. Step 4: To fill API key field, go to Paldesk app, choose ‘Administration’. Under ‘Embeddable elements’ select ‘Website Widget’. Step 5: Click on ‘Install’ and go to the bottom of the page and copy the given API key. Step 6: Return to WordPress clipboard and paste API key. After changes, press ‘Save’. The Widget will now appear on all pages on your WordPress site. There are few cases when the manual installation of a WordPress plugin is appropriate. For example, if you wish to control the placement and the process of installing a WordPress plugin or if your server does not permit automatic installation of a WordPress Plugin. Step 1: Download Paldesk plugin from WordPress.org plugin to your desktop. Step 2: Under Plugins, select ‘Add new’, click ‘Upload Plugin’ and put your previously downloaded folder here. Step 3: After you’ve chosen the file, press ‘Install Now’ then ‘Activate Plugin’. Step 4: You’re done! Your plugin is activated.